With the approach of exam period and the holiday season, the Laurier community should be aware of alternate schedules for some services on the Waterloo and Brantford campuses. 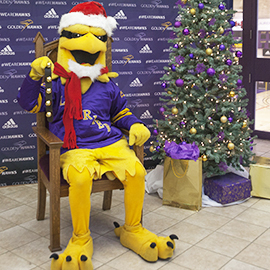 Laurier’s fall-term exam period runs from Dec. 10 to Dec. 21. During this time, most university offices will maintain regular hours, but some food outlets and other services will operate on exam-period schedules. Below is a guide to what’s open and when throughout the month of December. Please note that the university will be closed from Dec. 23 to Jan. 2. During this time, all university buildings at all campuses and locations will be locked for security purposes. Laurier's Toronto office will also be closed during this time. All locations will re-open on Jan. 3 unless otherwise noted. In case of emergency during the holiday closure, contact Laurier’s Special Constable Service at 519.885.3333 in Waterloo or 519.756.8228 x5888 in Brantford. Regular hours until Dec. 20. Dec. 21 – 7:30 a.m. to 7 p.m. Closing for the semester Dec. 22 at noon, re-opens on Jan. 2 at 4 p.m.
Dec. 12 to Dec. 15 – 8 a.m. to 9 p.m.
Dec. 16 – 8 a.m. to 7 p.m.
Dec. 17 and Dec. 18 – 11 a.m. to 7 p.m.
Dec. 19 and Dec. 20 – 8 a.m. to 7 p.m.
Dec. 21 – 8 a.m. to 3 p.m.
Dec. 8 – 8 a.m. to 7 p.m.
Dec. 9 – 8 a.m. to 4 p.m.
Dec. 12 to Dec. 15 – 8 a.m. to 7 p.m.
Dec. 16 – 8 a.m. to 4 p.m.
Dec. 19 – 8 a.m. to 7 p.m.
Dec. 8 – 8 a.m. to 3 p.m.
Dec. 12 to Dec. 15 – 8 a.m. to 4 p.m.
Dec. 12 to Dec. 15 – 8:30 a.m. to 7 p.m.
Dec. 16 – 8:30 a.m. to 3 p.m.
Dec. 7 – 9 a.m. to 9 p.m.
Dec. 12 to Dec. 15 – 9 a.m. to 7 p.m.
Dec. 16 – 9 a.m. to 3 p.m. Closing for the semester Dec. 23 at 3 p.m.
Dec. 21 – midnight to 7 p.m.
Dec. 22 – 8:30 a.m. to 5 p.m. The main offices of the Centre for Student Success and Accessible Learning Centre will be operating as usual, open from 8:30 a.m. until 4:30 p.m., during the exam period. Times for student appointments will be limited at certain centres. Students should check the Writing Centre and Study Skills Centre websites for each centre’s availability. The Math Assistance Centre will be offering drop-in homework hours and exam review sessions. Information will be posted on the Math Assistance Centre website. Monday to Thursday – 7 a.m. to 10 p.m.
Friday – 7 a.m. to 8 p.m.
Sunday – 9 a.m. to 10 p.m.
Dec. 19 to Dec. 22 – 8:30 a.m. to 4:15 p.m.
Dec. 19 to Dec. 22 – 8:30 a.m. to 4:30 p.m.
Dec. 12 to Dec. 21 – 8 a.m. to 4 p.m.
Closed for the semester as of Dec. 21 at 4 p.m.
Dec. 8 to Dec. 16 – 9 a.m. to 4 p.m.
Dec. 8 – 8 a.m. to 8 p.m.
Dec. 9 – 8 a.m. to 5 p.m.
Dec. 10 – 1 p.m. to 5 p.m.
Dec. 11 – 5 p.m. to 9 p.m.
Dec. 16 – 8 a.m. to 5 p.m.
Dec. 19 to Dec. 22 – 8 a.m. to 5 p.m.
Dec. 5 to Dec. 16 – 7:30 a.m. to 3:30 p.m.
Open regular hours during exam period, call 519.756.8228 x5803 to book an appointment. Monday to Friday – 10 a.m. to 8 p.m.
Saturday – noon to 6 p.m. The Accessible Learning Centre will be open regular hours throughout the exam period, closing for the semester as of Dec. 23. Writing and Study Skills Services will offer services by appointment and host exam preparation programming. On Dec. 8 from noon until 6 p.m., "Be Calm and Study On" will offer students one-on-one assistance and mini-workshops focusing on exam preparation. Exam review facilitated study groups will begin the following week. Email lbwritelearn@wlu.ca to make an appointment or for more information. Dec. 12 to Dec. 16 – 10 a.m. to 5 p.m.
Dec. 17 – 10 a.m. to 3 p.m.
Dec. 19 to Dec. 22 – 10 a.m. to 5 p.m.
Dec. 12 to Dec. 22 – open Monday to Friday from 10 a.m. to 2 p.m.